David Clough had paid for hundreds of gorgeous, professional photographs of his custom built homes. But the tiny, low quality images on his out dated website weren’t doing them justice. ALX created a sleek, modern, portfolio website for the construction company, complete with a project gallery and full-scale high-resolution images on every page to show off the incredible work. David Clough’s old homemade logo needed an update without losing its classic, architectural voice. ALX was able to help by updated the weight and feel of the typeface used in the logo, and recreating the imagery to have a touch more strength and visibility to ensure it would remain recognizable among customers. Word of mouth and excellent quality craftsmanship has kept David Clough Construction in business for years. In times of a stuttering economy and a recovering housing market, even the best need a little advertising boost to reach new customers outside of their usual market. 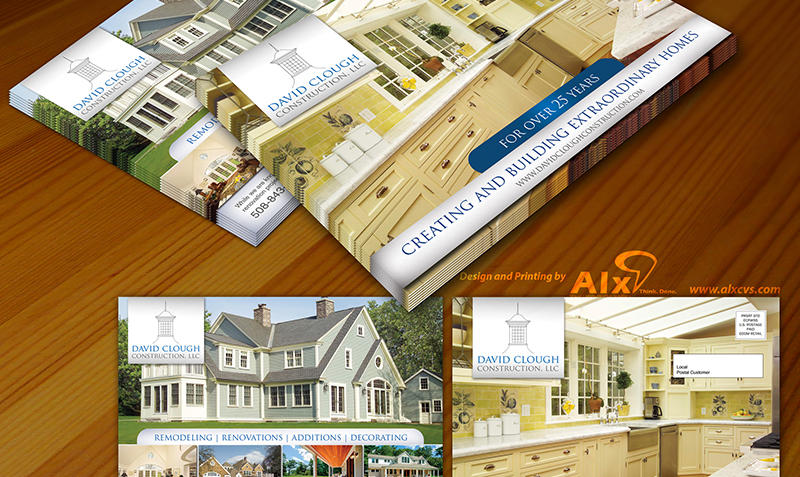 ALX created classic, elegant EDDM mailers using the amazing custom photography provided by the client. These beautifully printed, glossy, full color EDDM postcards look like a page from an interior design magazine, and will certainly catch the eye of the potential client sorting through the mail. The EDDM postcards were sent to a targeted market in upscale communities.